Low mounting must not be a concern for most folks though. I sell way, way more standard GoPro adapters than the LoPro version. 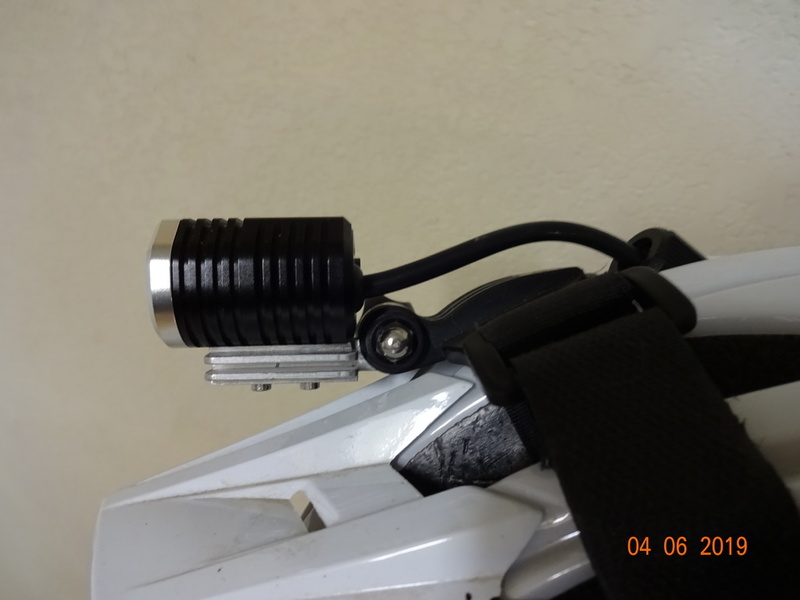 I also did the LoPro adapter for Ituo lights in a flip/flop style so it could be low or extra low. Most pics I've seen of folks using them do not have them in the extra low position. Does this look better? Do you have the lopro option for all lights? Yep. Was gonna ask you if the extra low position worked with that Ituo mount. There has not been enough demand for me to design and build LoPro versions for any other lights. I have sold a small number of undrilled LoPro adapters so the buyers could modify as needed to fit their particular light. This kind of circles back to Outbound's thread and why I posted earlier that while some users would appreciate a lower profile mounting, I don't see it being anywhere near a majority. I think the mounting design Outbound posted earlier for his new self-contained light will satisfy most potential buyers. @ Outbound : I'm still waiting for that mountain bike light of yours to offer a more NW beam tint. That said gotta have a remote, wired or otherwise as well. 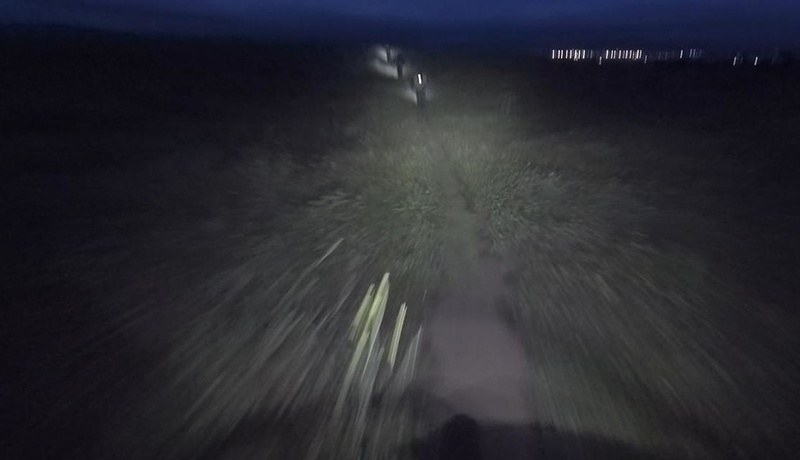 If the Raveman lights were offered in NW I might not have posted this comment but than again I tend to favor bar lamps with separate battery packs over self contained lamps when I MTB. Anyone interested in an OB Trail Edition with a bit of scuffing on the top from the bike being flipped over? Probably 30h of use. I ride desert and a lot of its beam is being lost, so I got the road edition on the bars and a traditional spot beam on the helmet to get the throw I need for trail riding. Figure someone who rides in dense canopy will enjoy riding terrain in which things are possibly brighter than it is during the day, with this OB Trail Ed. I also got a L&M Taz 2000 still fresh in package, which I chose the OB Road over (for run time). Doubt anyone would want it though, cause it's 290 MSRP. More of a pocketable commuter light. I'm with these comments. 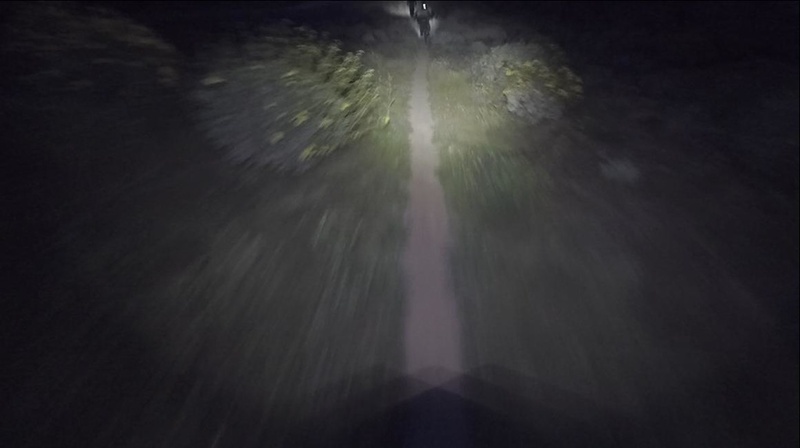 Early in my night riding days, I caught a high mounted light on a tree branch. No fun. I like and use very low mounting for my helmet lights. Having a low option on this new Outbound light would appeal to some users, but I'd guess not enough to warrant the extra work to provide it. Low mounting makes a light not work with some helmets that have integral GoPro mounts. They typically are at the very top of the helmet and won't allow some lights with low mounting to be aimed down far enough. There may be some issue with tool design for casting the housing that makes a low mounting less manufacturable. On my GoPro adapters there is extra machining with a smallish tool that must be done to make it work. That adds time which is why they cost more despite using a smaller piece of raw material. Outbound has some lofty specification and performance goals for this new light. Even with it's somewhat high profile (not as high as many other helmet lights though) if it hits most of the performance and specification goals, it will be a very nice light. You almost hit the nail on the head. It's a challenge for manufacturing with the way the case is developed, plus for those that have mounts right on the top of the helmet it is tougher to aim. However I will see what we can do to get it a little lower profile. It's an enormous difference over the primary target competitor, the NR Lumina and L&M Urban. This is why I like leaking some info and get some feedback quick before we commit to tooling. I've got some ideas now on how to keep the form factor yet get that lower profile. This light also has the goal of being extremely high quality feeling and durable. Overmolded features to make it IP67 rated, as well as feeling like a GoPro Hero 7 in terms of quality, just not as heavy. Unfortunately won't be able to offer a whiter light anytime soon. A remote is something that we are also looking into. Something a little different from what others are doing too, but that's still early on. Uh...that wasn't what I was asking about. NW or Neutral White is less white than what you are using. Not sure if the LED array you use comes in any other tint but if it did there is a market for NW MTB lights. Specifically, something in the 4500K range would be awesome. Got to have remotes. Itou's tint is a bit yellower's than OB's, but seems to mix well for my needs. Looks like OB's personal promise that they gave me in their chat, that it would be the last light I buy, fell through. Feeling better about this newer setup, compared to the DH package. The Altilon starts out on the lower end of the 5000k spectrum (closer to cool white), and then when it passes the reflector and through the lens it gets knocked down to the mid 4000's (closer to warm white). But the Altilon chip itself doesn't get any warmer since it's automotive qualified, so won't be able to go any warmer either. Changing up chips for the new light, so will have a wider spread of stuff to choose frome, but will still be looking to match the tint of the Trail so that it's seamless with existing lights. Subscribing to this thread for the self-contained light data. Been a big fan of the Exposure Diablo but their QA has been falling behind a bit with the past few lights and the pricing is no longer competitive. I agree on the Exposure lights. The other big dawg is the Lupine lights. They are outstanding as well but sickly expensive. - Keep it simple. No tap crap, no auto-dimming, no crazy programmable crap. No crazy button sequence to make it turn on or off. - Optimized for 2+ hour burn time. - 2 settings. High and Low w/o low being as low as mechanically possible. - Ability to plug in an external battery as a just in case. I want good high and low beam like a car with a simple switch or remote next to my hand grips to accomplish this. Why do I have to cycle through 97 modes to get to $&@?! Modes that are actually useful. High low just like a car it isn’t hard. Edit: this isn’t a complaint with your light (I don’t own one yet) it’s just with every light I have tried. Last edited by jeremy_burke; 2 Weeks Ago at 12:43 AM. For me the smooth/even beam coverage you get with the OB lights improves overall visibility as does using a warmer tint but in a different way. I do really like NW tint for solo off-road riding but for riding in groups and anything paved I think the tint of your current lights is a better compromise. That said think the new light should as close as possible match the emitter tint of your other lights. Thanks for the updates. New light design looking good so far! Alright took your advice and modified the mount location a bit. Doesn't look too bad! The prototypes that will be used for functional testing will be of the older design. They have been machined from magnesium to test for thermal loads to best simulate the actual die cast material. Those should be arriving in a few days. Might notice another feature, the hood. This was requested from some people based on some feedback of the previous lights. Not really necessary for helmet mounting, but if people mount it on their handlebars, it will be nice to keep the light out of their eyes when climbing. I agree with this. I pretty much want full output or low output. I generally don't use the mid-brightness modes. I have had mixed opinions on a remote. This past fall/winter was my first real night riding season and now I get it. I think a wireless remote that can control the bar light and helmet light simultaneously would be pretty useful. Has it been a week and a half yet? I wanna see that light. Fo a helmet light, I like 3 levels. Low and High for riding, and an extra low that requires some extra action to enable, in other words, not part of the normal switching from low to high and back to low. The extra low level is useful for light to fix a mechanical or flat or read the map. IME, a low level that is good for riding is too bright for fixing or map reading. Even better ( for a road version ) would be just two modes as you suggest but that the two modes be user programmable so you have the exact output you want for both modes. The advantage of this is that ( for longer rides ) you can choose to use outputs that can extend run time. I like this idea. Although to be honest I really only need one programmable and one high beam (so bright it melts the road). Couple that with a good easy to operate helmet light for when I hit the gravel/double track, which I do as mush as possible. Crunchy roads are the best roads. Your not going to get that (so bright it melts the road) from any of the current OB lights and doubtful from the new (lower powered) self-contained light they're currently working on. Beam pattern and best visibility from the light they produce is more what these light are about. Cat-man-do proposed UI works for me too. I know, please don’t ever take me too seriously. I’m prone to hyperbole. Alrighty guys, got all our prototype lenses, machined magneisum lower, and overmolded printed uppers in today. I'm not terribly thrilled with the overmold print quality, but I knew it wasn't going to be production spec. However very happy with the prototype optics and it's going to be great to be able to really test the optics quick (10 day turnaround) and make any tweaks before we commit to tooling. Going to give one more teaser of the optic before I start a new thread for the new light once we have some pictures of the light lit up and powered on next week! The optic on the top is printed in "clear" on my 3d printer, can tell what a different a proper prototype can make. So I’m guessing you’re using a different led than the bar lights. 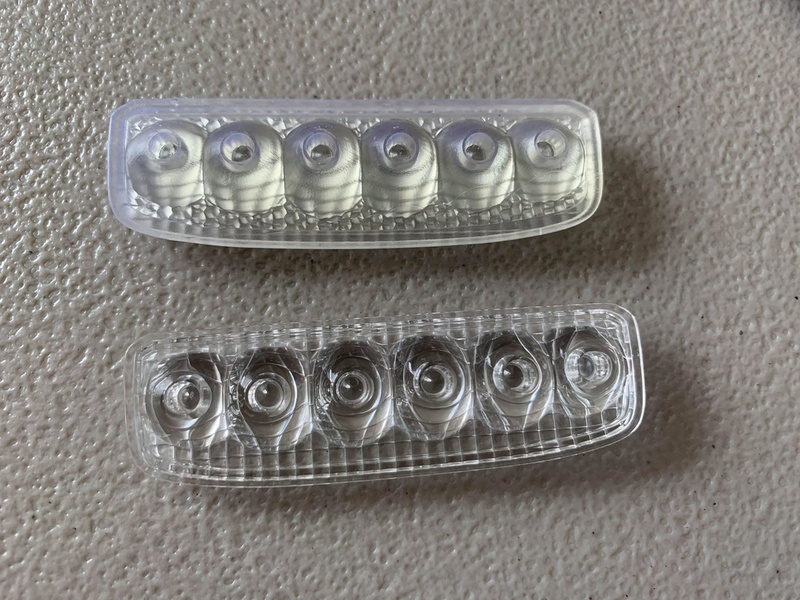 Yep, the Trail and Road Edition use an Altilon 1x5 chip which is very lumen dense, in this light we are going with 6 individual LED's that will either be Lumiled FX Plus chips or CREE XQ-E High Intensity. I'll explain why in more detail in the new thread. I like the "joined" optics. 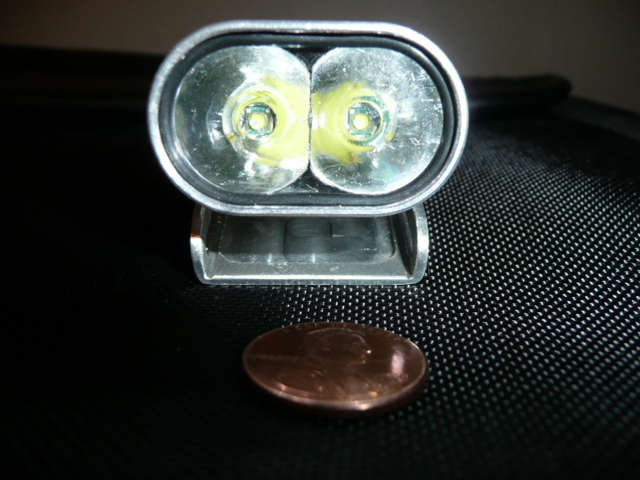 I did a "joined" reflector light several years ago with 20mm reflectors and Cree XPG emitters. 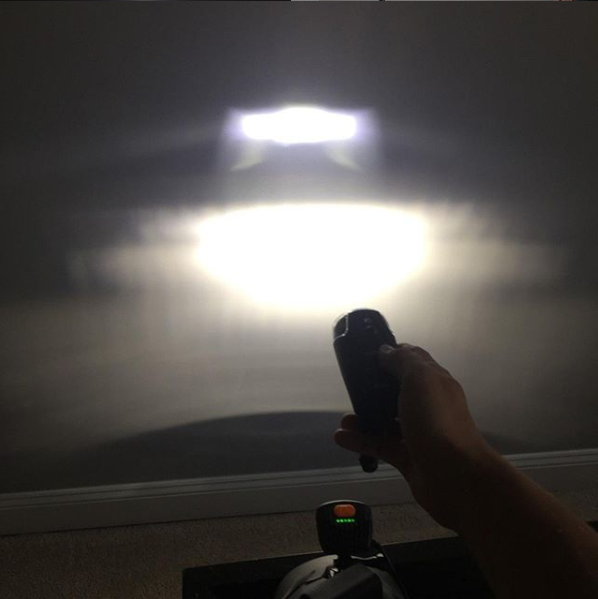 It made a really nice beam and was my goto helmet light for ~3 years. 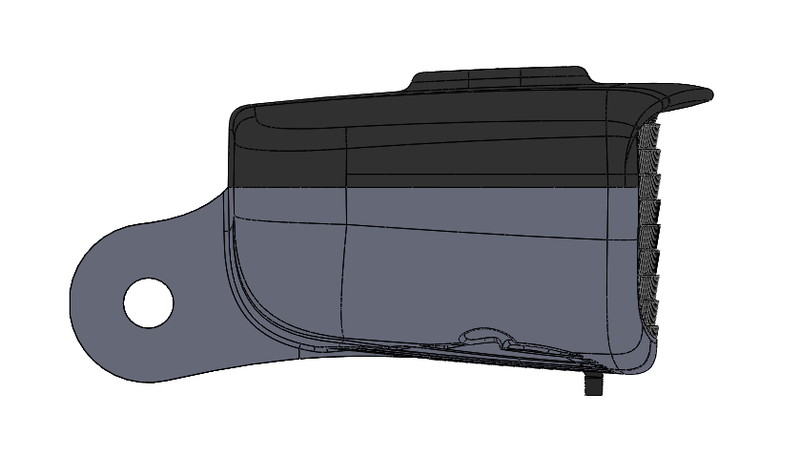 Is the texturing (presumably for beam smoothing) on your optic on the face side? I have found that texture on the face can collect mud that is hard to clean out mid-ride. Prefer a smooth face. Yep, joined in this particular case was mostly to improve the asthetic and get it a bit more compact. The actual TIR's are shaped slightly different on each individual one to shape the beam pattern so that it has the stronger hotspot, soft falloff to the side, and the light carpet that we are known for. The facets on the front are indeed for further beam shaping both in a horizontal and a vertical fashion. They are quite small and short, but radiiused so that getting mud off is no problem, that was something I had factored into the design. Silicone optics again since these are similar to the Focal lights where the lens forms the seal. Man if this has the throw and spot of my BT-20 with spots you’ll be taking my money again. .....The actual TIR's are shaped slightly different on each individual one to shape the beam pattern so that it has the stronger hotspot, soft falloff to the side, and the light carpet that we are known for. That is awesome. So cool that you have design tools and experience that allows you do this! Again, a really nice touch. The optic I had with texture on the front basically had numerous "bumps" that met the front surface at a sharp vertex. After wiping with a glove, a little ring of mud would sit in that vertex much to the detriment of the beam throw and output. 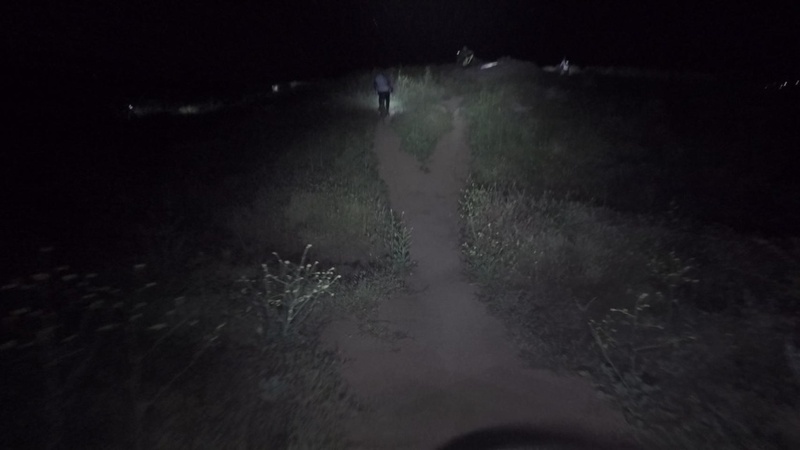 Running with that thought that I believed the Itou was good enough for desert conditions to be the only light I need, I relied on it a bit more tonight. I discovered its primary setback: when it runs out of juice, it just suddenly cuts out. OB has legendary run time in comparison. I do a 5 PM to 10 PM ride every Thursday, so I really need that run time. With battery conservation habits, such as turning it off at stops, low on climbs, and only high on fast descents, it cut out on me about 15 minutes before the end of my ride today. Will we be seeing a prototype in action at the Quail Ridge Rampage this Saturday? Unfortunately no. The initial prototype is heading to AZ for my electrical engineer to play with and get the driver testing started. There will be lots of demos of the Trail Edition however at Quail! What size battery pack are you using for the XP3 on your helmet? Somehow I’m imagining you’ve got a two cell on the back, in any case I doubt you have it attached in any way to the original 4-cell Ituo pack? Because I found the run time on mine was only 90 minutes of mixed use despite the manufacturers claim of over two hours on High alone. In any case, if you can stand running the cable to your jersey or jacket chest pocket, Kaidoman’s 4-cell flat pack might be an acceptable solution for you. I was amazed when I first slipped mine into my Docker’s flap pocket and didn’t feel the weight at all. My own personal fantasy right now is a 4-cell self contained light with dual mounts that could fasten to a handlebar stem and whose angle could be adjusted by some kind of locking ratchet mechanism in the rear. Since the Outbound Trail/Road reflector lens is so huge am guessing there’d be room for four cells — or maybe even six? — behind its footprint. I'm using the original 4-cell Itou pack. I estimate 2.5h* of mixed used. I used to run the OB with an extension to my pack, but I strap the Itou's battery to the back of my helmet (TLD Stage). My neck doesn't mind the extra weight and the helmet doesn't shift its fit around with it there. * this is assuming I started using it at 7 PM, it cut out just before 10 PM (finished ride at 10:19 to be exact), and I had it off maybe 30 minutes worth in between. I wasn't so stingy with the OB's use, knowing it has that 1-h reserve function programmed in. I just needed more throw and I rarely ever use "high" on the OB (usually just set-and-forget with its "Adaptive" slowly-dimming mode). Could be, might be. With the upcoming 21700 cells starting to become more mainstream certainly hope to start incorporating those in the future. But any changes to the Trail or Road edition like that would still easily be a year or more away. Currently all focus is on the smaller self contained light to compete with the Lumina and Urban. Wow that would be great, OB! Because in my decade and a half of night riding, have found connector cables to be the weakest link in any setup— experienced countless problems/failures. Magicshine style waterproof “pop” connectors tend to freeze in the cold and become impossible to separate at the end of a ride — not to mention they can break electrical contact even during the course of the event while still remaining stuck together, necessitating the user to twist the sockets back and forth until the lamp’s charge indicator comes back on. Screw connectors IIRC are not so bad in that regard but like the Magicshines their internal wiring can often sever at the junction with the molded sockets or where soldered either to the batteries or even lamp if there is not proper stress relief (two out of three of my KD six-cell packs have died that way and the third hasn’t far to go) plus over time the electrical contacts themselves can wear down to nubbins. Have recently received a bike lamp that came with a faulty battery cable fresh out of the box and the replacement’s cell pack only had about a third of the run time it was supposed to have. Then again the self contained light ordered from the same company immediately self drained its internal cells and then would not recharge over the built in Micro USB. But at least that was just a problem with the manufacture of the circuit board, and doesn’t represent the same kind of common vulnerability as with connector cables... or so I hope. Anyway, looking forward to seeing your new model upon completion. With the upcoming 21700 cells starting to become more mainstream certainly hope to start incorporating those in the future. .
Are 21700's a possible power source for the new self-contained light? I don't see much of a problem with you making a better light than your Lumina/Urban target competition but rather overcoming their brand name recognition as your major hurdle. Even tougher if either of those lights do a 21700 upgrade. 21700 is indeed a potential power source, although we've been moving down the road towards 18650 mostly because it's lighter and cheaper to get high quality cells. To get a high quality 21700 would cost twice as much and add an extra 20g or so in weight. The dimensional change isn't too bad, can be fit in the current design with a little massaging, but my main concern has usually been weight. We'll be able to exceed the runtime of the name brands with the current optic and LED design without having to resort to the heavy throttling that self contained lights are known for. Though you do bring up a good point, that it's only a matter of time before the others jump on the 21700 bandwagon, which then they might be able to match the runtime of the new light... But it'll still be 50-80g heavier than ours. Is it time yet? Can I pre-order now? Glad you are getting amped. However I decided to push back the pre-order a few weeks. We got the prototypes, the optics look amazing and perform as simulated, but decided to tweak it, get a little more punch, pull in the width a bit and massaged the optic a little more. So another round of protos required. Also getting more production-looking prototypes of the overmolded parts with the screen printed logos so that it will be more clear what you are getting. Only get one chance to really impress, so I want to make sure we impress. As a quality manager that deals with post production engineering changes constantly, good for you! This entire design process is fascinating. Who is able to provide quick optical prototypes? Do you do the optic design/simulation yourself? It's never easier - you just go faster. There is a prototyping company overseas that specializes in optical design work. 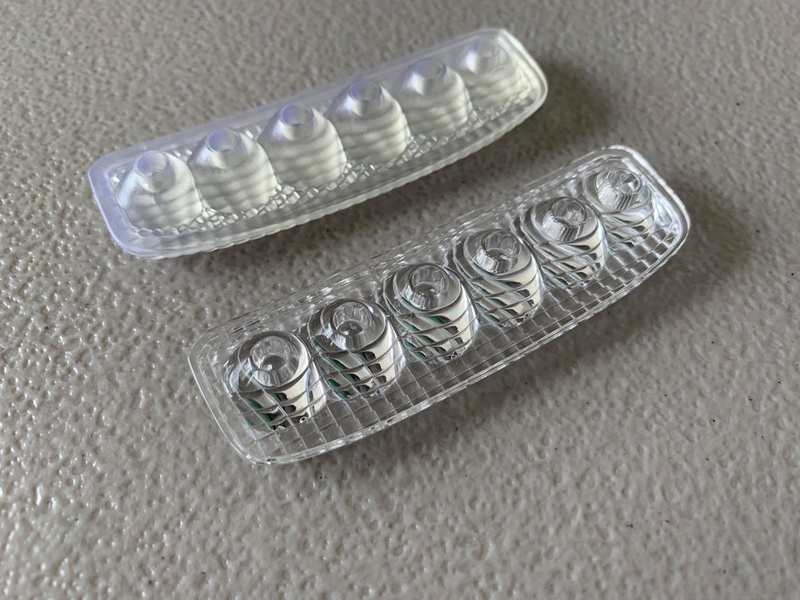 They machine pieces of solid acrylic, polish them to the specs required, then create a silicone mold to create the silicone versions of the optic. The index of refraction is slightly different, but close enough that can judge the production optic off of it. I do indeed do all the optical design and simulation myself. I use a software package called Lucidshape which is used in automotive lighting design. One of those really niche pieces of software that costs a fortune, but with it combined with my years of optical design experience in the automotive space, is our technological advantage over other lights in this space. 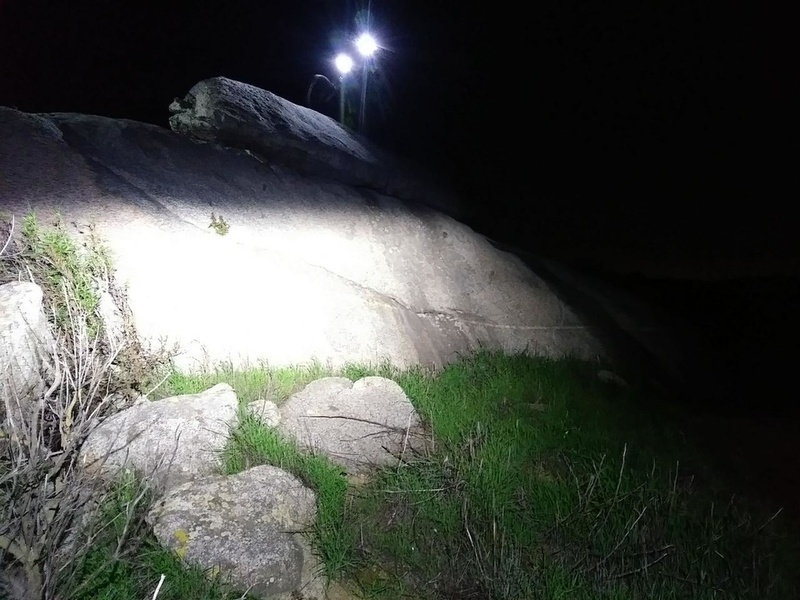 Seeing that no one else in the industry was taking lighting seriously beyond more lumens in off-the-shelf reflectors was why I decided to take the leap and start this company. Wow. You are the real deal. Thanks! What is your favorite focal length? All times are GMT -7. The time now is 10:49 AM.